Firstly thanks to the few girls that left comments on my last post. I expect most people just overlooked it. Not her again. Anyhow. 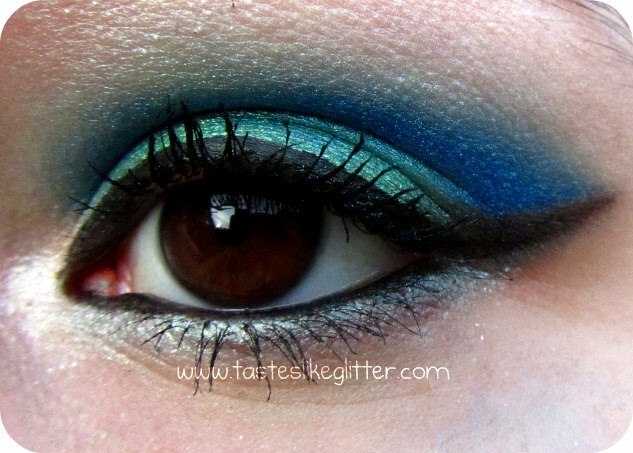 I just got extremely bored and whipped together a quick EOTD. I wasn't really sure what I was going for, I just wanted lots of colours. It looks I fell head first into my New York BOS! As I said, I've only just done this so the sun is setting and the pictures weren't so good but you get the idea. 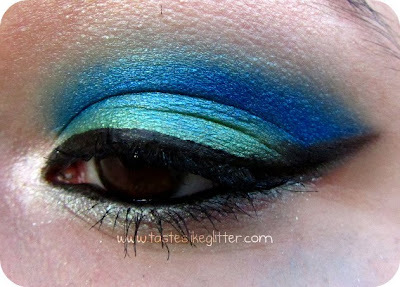 Urban Decay Eyeshadows - Kush (all over lid), Haight (crease), Radium (cut crease), Loaded (outer V), Money (lower lashline). M.A.C Kohl Power Eye Pencil - Feline (waterline). Honestly not the best I've done by a long shot, but certainly not the worst. I was having a little bit of writing block and some other problems, which is why I spent a bit of time away. But I'm curious as to what you want to see more of. There's a poll just over there --> So please open in your browser and vote for what you'd like to see more of! I keep thinking of more answers and adding them but I shall stop now. If you can think of anything I haven't mentioned please feel free to suggest in the comments.